“Forbidden Hollywood” is such a fun title, suggesting all kinds of naughtiness in film. Most recently, it was used for a three-volume line of TCM Archives DVD collections with some of the best pre-Code movies out there, including the one that sums it all up for me, Baby Face starring Barbara Stanwyck. Now comes news (link no longer available) that the Warner Archive is reviving the label, with six DVDs coming out June 26. The high point for me is the release of Jewel Robbery, a 1932 film with William Powell and Kay Francis. 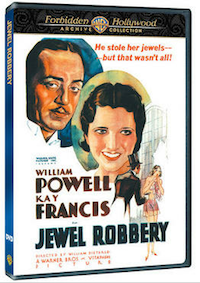 Jewel Robbery is a romantic comedy in which Francis, as the bored wife of a rich man, gets taken hostage by a clever gentleman thief (Powell) during his robbery of a jewelry store. The two form an instant connection, leading to complications when the police try to catch the robber. Update: The new Forbidden Hollywood sets are available from the Warner Archive, and they’re structured slightly differently. There are two volumes, each containing four films. The two sets retail for $39.95 each.